In Lady of the Nile by Veronica Scott, Khian, a decorated commander, has been assigned to Thebes to serve out his military career before returning to his farm for planting season. Tuya is one of the most trusted companions of the Pharoah’s wife. When fate throws them together for Khian to act as protector, their attraction grows. When Tuya is kidnapped, Khian is her only hope. 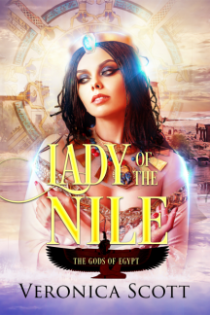 Lady of the Nile is the seventh book in the Gods of Egypt series. The author, Veronica Scott, gave me a copy of this novel in exchange for my review. Regular readers of this blog will know I love a Veronica Scott romance. While her work is generally excellent, her sci-fi books remain my favorite, but the Gods of Egypt series is outstanding in both consistent quality and creativity. It is very easy in the romance genre to tire of the formula and it often gets a bad rap because it seems too easy with not a lot of thought involved. Boy meets girl, boy and girl have instant attraction as a sole result of their snap-together parts (though their extreme attractiveness screams of reincarnated glowing deity). They both have huge baggage and lack of trust and usually abandonment issues. There’s a slight nod to some sort of peril that tosses them together and accelerates their relationship with a “life is too short” perspective and before you know it, they’re telling their excited relatives of an upcoming wedding. Seriously, I’ve had relatives who have married someone they’ve known a month and I was more surprised and skeptical than happy for them. Did you jump up and down with glee when your niece, cousin or bestie married someone they literally just met who you’ve seen has HUGE baggage? This overall outlook is a stereotype that does not apply to an author like Veronica Scott, who puts in the work. There’s very purposeful movement in a Scott story and while it’s a romance, so that aspect is rather a foregone conclusion, there are other reasons to read that lock in the artistry of the narrative. Tuya is comfortable in her life. She has a half-brother who has a bit of an impulse control problem and is a waster and she feels responsible for him. He wants her to join him in his adventures to find a husband, but Tuya likes the feeling of being valued and her position as a trusted member of the household. She seems a bit afraid of her own emotions, but without being timid. She’ll travel the dangerous roads of Thebes at night if it means helping the people that value her. Khian is a bit more of a mystery at first. We know that he seems kind and he’s decorated, so the takeaway is that he’s brave. When he finds Tuya traveling through the city at night, he insists on joining her, but he isn’t interested in damaging her reputation when he finds that she’s slipped out of the window of her nurse’s home where he waited for her. These characters have a mild attraction but a slow burn. Tuya and Khian would be Maddie and David from Moonlighting in the modern day. They’re thrown together but both of their positions leave them not looking beyond the charm each exhibit. In Lady of the Nile, Scott builds her characters and then builds the suspense. Some readers may find the progression slow, but in the slow build to the story, Scott gives us an information overload in a really interesting package. We have the context of the ancient world, the structure of the world in which our new friends walk. There’s basically what amounts to a mental ceremony at the start of the book and to the ear of this reader educated in the ancient world, the construct is plausible. When the action starts going, the story divides, but the author’s shifts are flawless. When Scott goes into the surreal other-worldly mode, readers may think they’ll eyeroll, but it fits so well and advances the story in a way that doesn’t lack credibility. I am astounded at how consistently professional and enticing Veronica Scott’s books are. Lady of the Nile is a well-constructed work of fiction. My only complaint is that at 194 pages, Lady of the Nile is simply too short. I would have liked to exist with these characters longer but to add anything would have been a mistake. So, yes, Lady of the Nile is a wonderful read and one that even if you’re not a fan of romance, you’ll enjoy. Start anywhere you’d like in the series. All of the books are stand-alones but read together, they’re a treat for a snowy afternoon. If you’ve yet to read this author, do so now. You’ll thank me. Seriously, Alison. This author is amazing. Her “Wreck of the Nebula Dream” is the first I read and still my favorite.